When you arrive in Shanghai to study or intern, there will be a lot of challenges ahead. In your first week, getting over your jetlag will just be the first hurdle. Every newcomer in Shanghai needs to go through some practical steps too, before they can feel properly settled in the city. For example, there are certain laws here to do with getting a mobile SIM card and registering your temporary address with the authorities. Looking back at when we were new arrivals ourselves, we know how valuable it is to have someone to help you with some of these tricky procedures – especially when you’re still learning the language. With these kits and services we aim to relieve the stress and let you concentrate on what you came here to do – learn, and have fun! Please note that kits and services must be booked before your arrival in China. It is not possible to add them after your program has started. 24/7 emergency support in Shanghai: We hope you won’t need it– but if you do, we will be there for you. Airport / Train station pick-up: Let our private driver take you directly to your accommodation. Police registration support: According to Chinese law, all foreigners staying in Shanghai need to register with their local police station within 24 hours of arrival – we will go with you and help you. VPN Solution – Facebook, Twitter, Youtube, Google plus a host of other sites are blocked in China. We can help you organize a solution, so that you can surf those websites you crave. Chinese banking support: We will advise you on the necessary steps to take. With laws changing regarding foreigners and banks changing all the time, we will keep you abreast of what you should know. Pre-charged Chinese 3G/4G SIM card: Including 700MB data volume & 50 minutes’ free local calls during your arrival month. Pre-charged Shanghai public transport card: For the entire Shanghai subway and bus system. Free bicycle rental: Explore the city on bike for the duration of your program. Free locker at the school: Store your books and valuables in a locker at the school and travel lightly as you explore Shanghai. Shanghai map pack: Including how to find the Bund or the Yu Garden. One-month Fitness Pass: Access to a gym next to LTL with all the facilities, including a swimming pool, climbing wall and daily fitness classes. Free massage: Release the tension after a long flight with a massage at a Chinese Medicine Massage Center (foot or full body). Please also Note – Standard Survival Kits for Shanghai and Chengde are already included in the Shanghai-Chengde Immersion program and the Multi-City Program. You will have to pay a safety deposit when you collect your bicycle or choose your locker. The deposits will of course be returned to you in full at the end of your program. Save yourself the hassle of navigating public transport or negotiating prices with a taxi driver. Available for Shanghai Hongqiao International Airport, Shanghai Pudong International Airport, Shanghai Railway Station, Shanghai Hongqiao Railway Station and Shanghai South Railway Station. 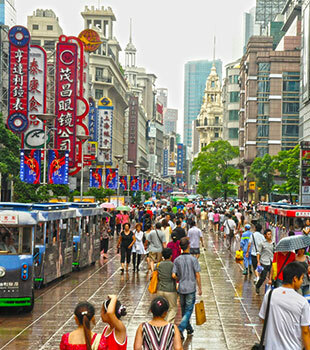 Getting to know local people is not only an excellent way to practice your Chinese language skills, it will also help you adjust to life in Shanghai. However, as a foreigner in Shanghai it is all too easy to get caught up in an ‘expat bubble’, where you mainly mix and socialise with other foreigners. There are many reasons for this – language barriers, cultural barriers and lack of opportunity to form long-lasting friendships with locals over time. At LTL we want our students to use the language outside of the classroom too. Interacting and socialising with local Chinese should be one of the highlights of your study experience in Shanghai. That’s why we created the Connection Kit, to help you form a circle of local Chinese friends from the very beginning of your stay. We will match you with two people before you arrive, who in turn will introduce you to other friends and contacts. Your personal Shanghai Student Ambassador: A companion and guide as you explore Shanghai together. Your Student Ambassador will be matched with you based on mutual interests, so there will be plenty of things to do and talk about together from Day One. Your personal Chinese Language Exchange Partner: Meet up regularly with your Language Exchange Partner over a drink or dinner to practice your Mandarin language skills, and in return help them with their English (or your native language).